The attention to detail in the design of our Versailles Night Stand is completely unparalleled and speaks a great deal to the integrity and thoughtfulness of our renowned Amish furniture artisans. This Amish night stand is an extremely sturdy design. All of the solid hardwoods used in construction are authentic American hardwoods – harvested from sustainably managed forests within the Appalachian mountain region. This superior night stand comes standard with full-extension soft-closing drawer slides, dovetail drawers, and a remarkable concealed top drawer for storing valuables. Customers have many optional features as well, such as an accessory organizer with power strip, a custom server tray to fit the top drawer, an extra hidden base drawer and many choices in hardware, hardwood, and finish. 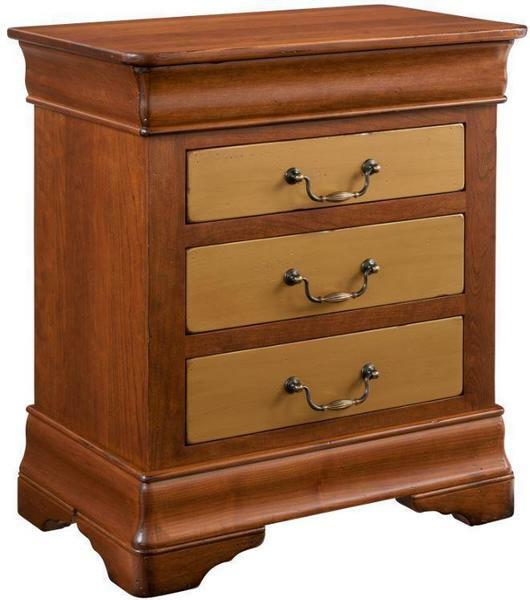 Made in America, this night stand is confidently backed by the Keystone Collection Lifetime Guarantee! I've purchased a number of items over the years - recently the Keystone Versailles Euro Sleigh bed and a pair of matching side tables - wonderful, excellent quality, customer service is awesome. Packing and shipping quality is over the top. Never a scratch on any piece! The packing is a work of art!